A few years ago, after shooting some dandelion puffballs, I noticed how much they looked like fireworks when seen larger on the computer screen! I decided to do a composite photo and have worked on it off and on for several years. I’m not sure it’s where I want it to be yet but thought I would post it on the blog for The 4th of July, 2012. Have a happy and safe 4th everybody! 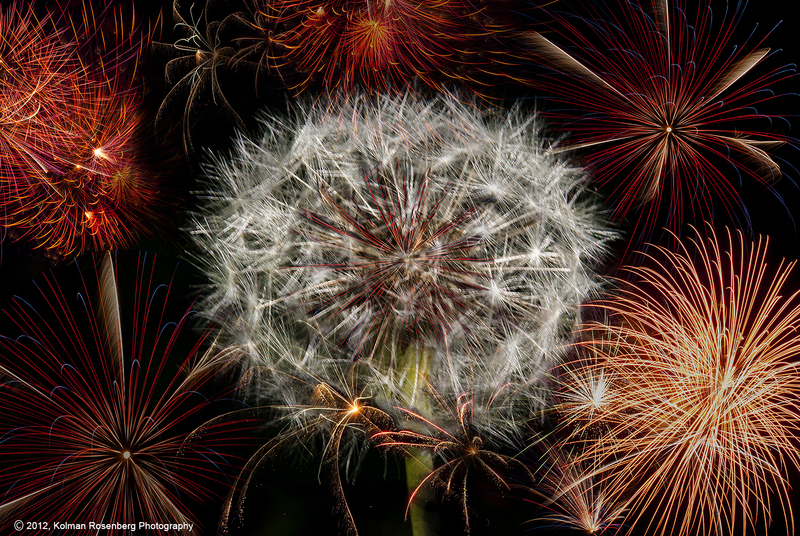 This entry was posted in Uncategorized and tagged 4th of July, composite, dandelion, fireworks, Independence Day, nature, photograph, photography, puffball, Seed, weed. Bookmark the permalink. Great shot, Kolman. Very creative. I wish I would have thought of that. Thank you both! I’d been thinking about this one for a few years! My Photoshop skills are starting to finally catch up with my imagination! I have to stop and look twice! i almost missed it. Great picture! How interesting! I love doing photoshop collages. Thanks Kathy, it’s always a learning experience for me! Kolman–I’m not sure where you want it to be, but I think it be beautiful. Thanks Carole! I’m not sure what I’m looking for either quite yet, just know I’m not there yet! Nice work with the photo! Happy 4th July! Thank you Alex! Hope you had a good 4th! You are welcome! Yes! I did!